The following Joint Publication is unavailable from the Defense Technical Information Center (DTIC) website. Though it does not have any markings indicating a distribution restriction, the DTIC website lists the document as being available only through the Joint Doctrine, Education & Training Electronic Information System (JDEIS) which is restricted to U.S. military personnel. MILDEC during any phase of an operation should help to mislead adversaries as to the strength, readiness, locations, and intended missions of friendly forces. In combat situations, the focus is on driving the adversary to culmination and achieving the objectives defined by the JFC. In noncombat situations, the JFC seeks to dominate the situation with decisive operations designed to establish conditions for an early, favorable conclusion. The MILDEC goal is the commander’s statement of the purpose of the MILDEC as it contributes to the successful accomplishment of the assigned mission. It is important for the commander to first envision the deception goal in terms of its specific contribution to accomplishing the designated mission. The MILDEC objective is a concise statement of what the MILDEC will cause the adversary to do or not do. It is expressed in terms of the adversary’s action or inaction that directly leads to the purpose or condition stated in the MILDEC goal. The deception target is the adversary decision maker with the authority to make the decision that will achieve the deception objective. The deception target or targets are the key individuals on whom the entire deception operation will be focused. • Causing ambiguity, confusion, or misunderstanding in adversary perceptions of friendly critical information. • Causing the adversary to misallocate personnel, fiscal, and material resources in ways that are advantageous to the friendly force. • Causing the adversary to reveal strengths, dispositions, and future intentions. • Conditioning the adversary to particular patterns of friendly behavior to induce adversary perceptions that can be exploited by the joint force. • Causing the adversary to waste combat power with inappropriate or delayed actions. 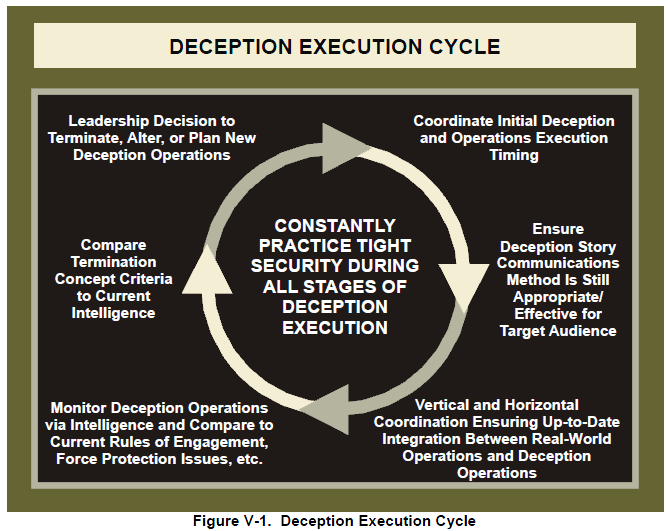 Deception planning is an iterative process that requires continual reexamination of its objectives, target, stories, and means throughout the planning and execution phases. A key factor that must be considered during MILDEC planning is risk. The overriding consideration in risk analysis is the comparison between the risk taken and the possible benefits of the deception. 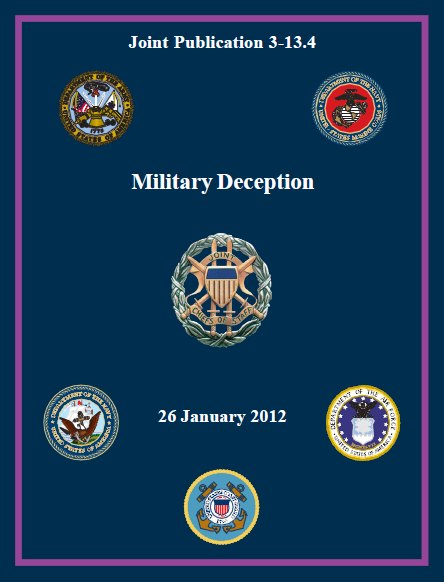 The MILDEC planning process consists of six steps: deception mission analysis, deception planning guidance; staff deception estimate; commander’s deception estimate; Chairman of the Joint Chiefs of Staff estimate review; deception plan development; and deception plan review and approval.